Thursday marks the day when Samsung is set to reveal its latest creation at the IFA expo in Germany. Many are still wondering if such a device can compete against the iPad money making machine. How will consumers respond given the large lead already obtained by Apple? With the tablet market set to explode, all eyes will be on the first real Android iPad competitor. So what can Samsung do to help ensure the success of the Galaxy Tab? Lets find out. Many will argue that tablets are designed more for consuming than producing, which results in a device that resembles a giant phone. By leveraging the true multitasking capabilities offered by the Android system, a tablet may actually seem viable as a netbook replacement. Yes, typing on an onscreen keyboard is still awkward; but for those that dont want to lug around a bluetooth keyboard, Swype will be a great addition. The key to productivity is a good platform, and Google has arguably the best cloud based office suite available in Google Docs. It has always boggled my mind that a solid Google Docs experience is not available in web or app form on Android smart phones. Documents are viewable, but cannot be edited. Perhaps its because it was not needed until now. For those like me that use Google Docs as a primary productivity tool, a seamless experience from desktop to tablet is a must. My biggest fear has been that the TouchWiz skin included on the Tab would be identical to the S lineup. From the teasers we have seen, Samsung is making efforts to ease my anxiety. 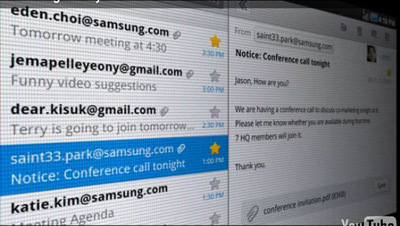 As we got a peek at in the preview, the Gmail application will allow a split screen view. Hopefully they did not stop here. A tabbed chat experience would be highly welcome, as well as good calendar support. With all the extra screen real estate it would be a shame to not fully leverage the experience. Samsung recently announced their 1 millionth Galaxy S phone sold in the US. How did they do it? A multi-carrier launch. A simple fact remains that many consumers are tied to specific carriers based on connection availability or work subsidies. As with most problems, the solution is giving the consumer every option possible. Samsung obviously has the connections and the knowledge from the Galaxy S launch; lets see it again. Hopefully the CDMA version of the Galaxy Tab spied this past weekend is more than just a proof of concept. You want to hit Apple where it hurts? Get them on price. I will admit, my jaw dropped when the pricing was first revealed for the iPad at $499 for the wifi model. Based on their premiums for desktops and laptops, I predicted to see a larger price tag. With prices yet to be announced, Samsung has a chance to really blow the market open. The Galaxy Tab will have smaller hardware than the iPad, so in theory should cost less to produce. A small $25 or $50 undercut will not work. Go big or go home. If Samsung can offer the wifi version of the Galaxy Tab for $399 ($100 less than the iPad), a large impact will be made. The American consumer has proven time and time again that they are more sensitive to sticker price than cost of associated plans. While its not exactly something Samsung can directly control, developers will be a huge part of whether an Android tablet of any brand will succeed. Will this prove to be further fragmentation of an already splintered operating system? Probably, but it is a necessary evil. While current Android apps do a decent job of scaling to various resolutions and screen sizes, tablet-specific apps and design features are needed to take full advantage of the Galaxy Tabs potential. One thing Samsung can do is create and foster an environment within their platform that caters towards developer needs. One area that Apple has down to a science is a fast, smooth user experience. Every time I stroll into an Apple store I find myself marveling at the responsiveness of iOS devices. Joshua Topolsky of Engadget fame has a simple performance test that I tend to use as well. Touch the screen and swipe back and forth as fast as possible. Can the device keep up? It should. Sluggish performance will ruin a superior user experience no matter how good it looks. For the love of all that is good, make enough units! If you cant get it into the consumers hands while the buzz is hot, youll miss your window. The HTC Incredible has been plagued with production issues, and sales have most likely suffered. At the current rate of new products released, lifespan can be rather short. Given that the Galaxy S lineup has been in good stock, lets hope it wont be a problem. So there you have it. If executed, will these points be enough to make you pull out your credit card? What do you think needs to be done to not only match, but beat the iPad juggernaut? Regardless of how things turn out, kudos to Samsung for stepping up and embracing Android as a viable platform. The times, they are exciting. Bravo. This is the kind of article I've been looking for here. I am greatly anticipating this product and others who will rivalrival the iPad. Let the war beginning and the consumer shall reap the benefits.